Cartridge heaters can be considered “component heaters” that are used to generate heat in many different applications. These process heaters are primarily used in mold and fit snug inside a cavity and helps heat solids by reaching high temperatures. Cartridge heaters have the versatility of being able to carry thermocouple inside to help control temperatures of the heater more accurately. Various diameters allow for it to be used in any cavity and can be custom designed with any cold section. Lead wires extend from the end to your control panels. Cartridge heaters are used as a water heater element and in a wide variety of applications. Some of these uses include bag sealing applications, hydraulic oil applications, motor oil applications, gearboxes, water heating applications as well as laboratory and food equipment. Sheaths can reach extreme temperatures as cartridge heaters can be designed with higher watt densities. High watt density cartridge heaters can also have different types of lead wire connections. For more mechanical processes, stainless steel braided leads are used against mechanical stress. BX cabling can be used for added protection, though it reduces the lead wire flexibility. Terminal pins are also available on all models. Cartridge heaters from Wattco are made of a swaged construction that consists in a high-grade nickel chromium resistance wire wound around a high-quality MgO core that is centered in a stainless steel casing. Cartridge heaters are used for heating metal parts and can also be fitted with threaded bushings for liquid heating for certain applications. 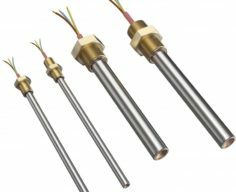 Cartridge heaters will reach metal temperatures of up to 1,400ºF (760ºC) with the appropriate material, watt density, and fit selections (see Figure 2 on our catalog page 7.2). Get a quote on a cartridge heater today. WATTCO also manufactures other industrial heating products such as infrared heaters, immersion heaters, pipe heaters and more. Click here to view all of our products. One optional feature on WATTCO cartridges is built-in thermocouples. These could be type “J” or “K”, grounded or ungrounded, and attached either at the disc end or the middle of the cartridge. In applications such as sealing bars or rubber molds, the two ends of a cartridge heater are usually colder than the middle. To overcome this inconsistency and have a uniformly distributed heat source, cartridges could be made to have higher wattages at the ends. 35/30/35 is a common wattage distribution. In applications where superior heat transfer is required, the tolerance on the outside diameter could be improved to +/-0.001″ by center-less grinding. WATTCO can also manufacture cartridges with cold sections and separate zones that can be controlled independently.